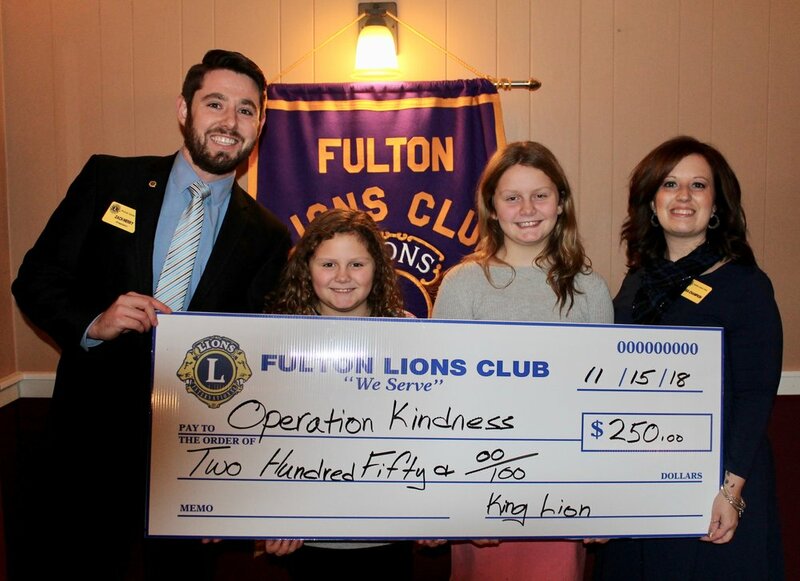 FULTON, NY – The Fulton Lions Club made a $250 donation to Operation Kindness, the brainchild of Autumn Barrick, a 5th grade student at Lanigan Elementary. In addition, James Karasek, advocacy manager, ARISE Oswego County office, made a presentation on diabetes at the club’s November meeting. The Fulton Lions Club made a $250 donation to Operation Kindness, the brainchild of Autumn Barrick, a 5th grade student at Lanigan Elementary, second from right. Operation Kindness, now in its second year, provides Christmas toys and gifts at no charge to those who need them. It runs from 9:00 a.m. to 4:00 p.m. on Sat., Dec. 1, in the community room of the Fulton Municipal Building, 141 S. First St. Each shopper may take two new/gently used gifts for each child in their home. In addition to toys, there will be free drawings for popular toys, and there are also some winter coats available. Joining Autumn were, from left: Zachary Merry, Fulton Lions president; her sister, Addison Barrick; and Lion Melissa Champion, who brought the program to the Lions club. For further information, contact Nichole Slocum at slocumnichole@gmail.com. Operation Kindness, a free toy store, now in its second year, provides Christmas toys and gifts at no charge to those who need them. It runs from 9:00 a.m. to 4:00 p.m. on Sat., Dec. 1, in the community room of the Fulton Municipal Building, 141 S. First St. When she was in 4th grade, Autumn wanted to bring Christmas to all families in our community, and Operation Kindness was born. Each shopper may take two new/gently used gifts for each child in their home. In addition to toys, there will be free drawings for popular toys, and there are also some winter coats available. For more information, contact Nichole Slocum at slocumnichole@gmail.com. Fulton Lions President Zachary Merry, right, thanks James Karasek, advocacy manager, ARISE Oswego County office, for his presentation on diabetes awareness and treatment at the club’s November meeting. Karasek discussed his personal experiences with diabetes, as well as the ARISE Diabetes Self-Management Program, open to people with disabilities and type 2 diabetes. Topics include: techniques to handle fatigue, stress, pain and emotions; improving strength and endurance; healthy eating, proper monitoring,; appropriate use of medication; skin and footcare; and questions to ask your healthcare provider. Karasek can be reached at (315) 324-4088, ex. 206, or at jkarasek@ariseinc.org. Karasek discussed his personal experiences with diabetes, as well as the ARISE Diabetes Self-Management Program, open to people with disabilities and type 2 diabetes. Topics include: techniques to handle fatigue, stress, pain and emotions; improving strength and endurance; healthy eating; proper monitoring; appropriate use of medication; skin and footcare; and questions to ask your healthcare provider. 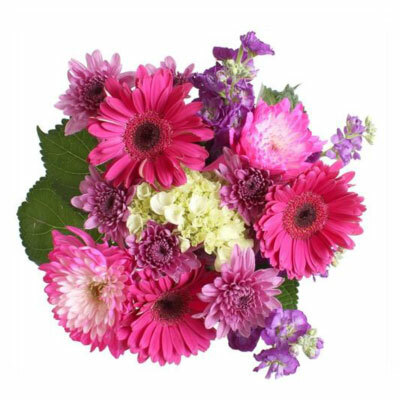 Karasek can be reached at (315) 324-4088, ex. 206, or at. 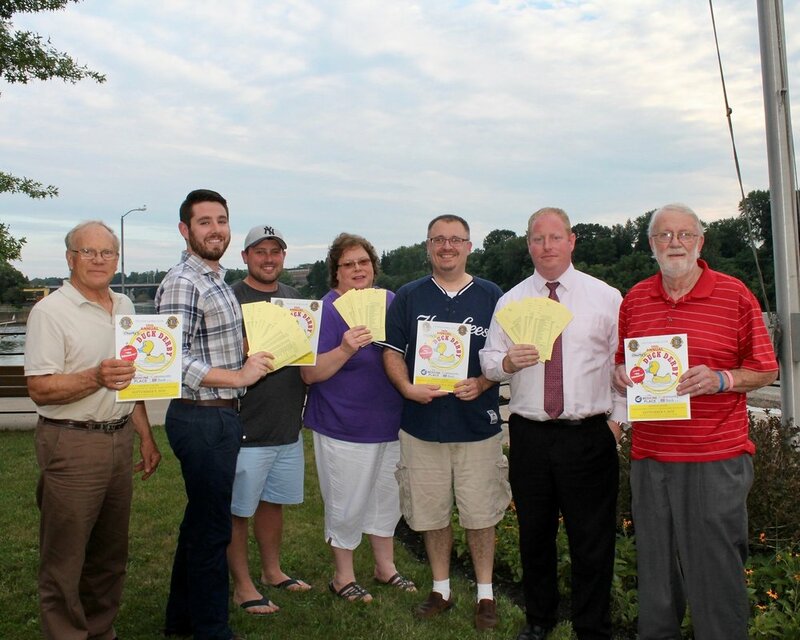 FULTON, NY – The Fulton Lions Club installed its new slate of officers for 2017-18 and presented club awards for the 2016-17-club year at their June 15 meeting. Michelle Stanard succeeds David Guyer as president. Other officers installed included: Zachary Merry, vice president; Linda Hughes, secretary; and Michael Reardon, treasurer. Lion Douglas G. Russell of Liverpool, past district governor, zone 20-Y1, presided over the installation. Other positions installed at that meeting include: David Guyer, immediate past president; Fred Aldrich, membership chair, Gail Holmes, tail twister, Geoff Sawyer, lion tamer, Deana Michaels, assistant secretary; Ron Browning, assistant treasurer, Brett Tallents, assistant tail twister; and Steve Chirello, David Dingman, Len Kellogg and Dennis Rupert were elected to the board of directors. David Guyer, who completed his second term as president of the Fulton Lions Club, hands the club gavel to Michelle Stanard, president for the 2017-18 year. The Fulton Lions Club installed its new slate of officers for 2017-18 and presented club awards for the 2016-17-club year at their June 15 meeting. Michelle Stanard, seated, is president and from left, standing: Zachary Merry, vice president; Linda Hughes, secretary; Lion Douglas G. Russell of Liverpool, past district governor, zone 20-Y1, who presided over the installation; David Guyer, immediate past president; and Michael Reardon, treasurer. 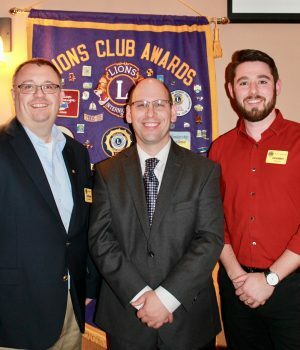 Established in 1993, the Uplinger award honors outstanding Lions, non-Lions and organizations that perform exemplary service to the club, district or community, Guyer said. “These honorees possess the highest examples of Lionistic character, ideals, purpose and service. Ron, Gail, and Steve have demonstrated that through their leadership. Both Steve and Gail are past presidents, and Ron has co-chaired our successful Lions Loot Sweepstakes for several years. All have volunteered for multiple projects and committees, and have been steadfast in sharing their time and talents. “Chartered in 1953, our club continues to be one of the most active in our district. We look forward to our upcoming Charby’s Duck Derby (September 10), to kick-off our next year of service to the greater Fulton community.” The Fulton Lions Club provides financial assistance for those in need of eyeglasses, eye exams, and hearing aids to residents in the Greater Fulton area. For more information, visit www.fultonlionsclub.com, or find them on Facebook under Fulton, NY Lions. Three Fulton Lions received the Robert J. Uplinger Distinguished Service Award. 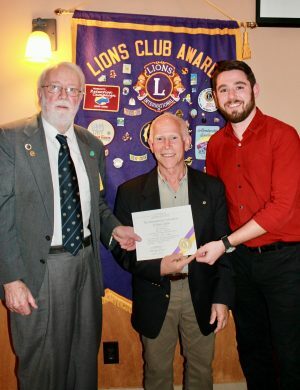 Established in 1993, the Uplinger award honors outstanding Lions, non-Lions and organizations that perform exemplary service to the club, district or community, said outgoing president David Guyer. “Recipients Ron Browning, Gail Holmes and Steve Chirello have demonstrated the highest examples of Lionistic character, ideals, purpose and service. From left: Holmes, Chirello, Lion Douglas G. Russell of Liverpool, past district governor, zone 20-Y1; Guyer and Browning.